Think Up was commissioned by the Royal Academy of Engineering to research and write three best practice guides on the teaching of engineering in higher education. 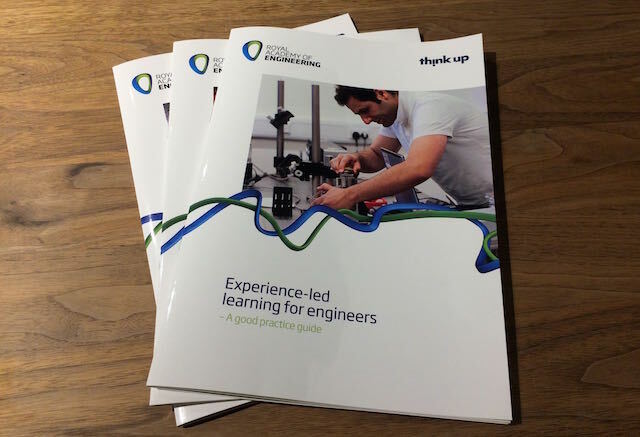 This report provides engineering educators with practical suggestions for how deliver best practice in experience-led learning in their teaching. The report identifies the main challenges that teachers face when using experience-led approaches, and proposes nine principles to over come them. The ability to apply theoretical knowledge to real industrial problems is regarded by industry as the single most desirable attribute in new recruits, according to research previously published by the Royal Academy of Engineering. For some time now, universities have been encouraged to help their students develop the skills and aptitudes that underpin the ability to apply theoretical knowledge in practice. This technique is known as ‘experience-led learning’, and while the components of experience-led learning are well established, significant challenges remain in implementing experience-led learning in undergraduate courses. This report focuses on three challenges that teaching staff face in delivering experience- led learning: the tacit nature of many industry-related skills; the social nature of many industry-related skills; and the use of judgement.